Complete and accurate documentation is one of the most important skills for a physical therapist assistant to develop and use effectively. 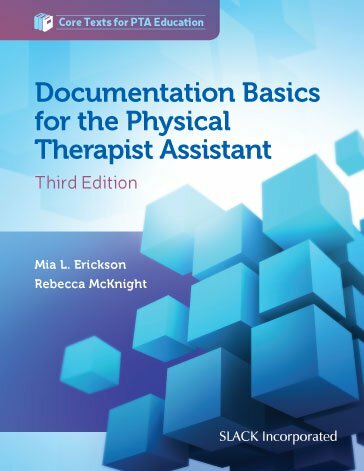 The new Third Edition of Documentation Basics for the Physical Therapist Assistant continues the path of teaching the student and clinician documentation from A to Z.
Mia Erickson and Rebecca McKnight have updated this Third Edition to reflect changes in the ever-evolving profession. Newly addressed are the changes in documentation requirements for major payers, changes in the disablement models used, and the increasingly common use of electronic documentation in the physical therapy profession. Documentation Basics for the Physical Therapist Assistant, Third Edition is the perfect guide for all physical therapist assistant students and clinicians who want to update and refine their knowledge and skills in documentation. Mia L. Erickson, PT, EdD, CHT, ATC, is a faculty member in the Physical Therapy Department at Midwestern University in Glendale, AZ. Mia earned a bachelor’s degree from West Virginia University in secondary education in 1994 and a master of science degree in physical therapy from the University of Indianapolis in 1996. Mia earned a doctoral degree in education from West Virginia University with an emphasis on curriculum and instruction in 2002. Her clinical practice is in the area of hand and upper-extremity rehabilitation. Rebecca McKnight, PT, MS, received her bachelor of science degree in physical therapy from St. Louis University in 1992 and her postprofessional master of science degree from Rocky Mountain University of Health Professions in 1999. She taught at Ozarks Technical Community College for 14 years, serving as Program Director for 9 of those years. Rebecca is an active member of the American Physical Therapy Association and is a former chair of the Physical Therapist Assistant Educators Special Interest Group of the education section. Rebecca has spoken at many national meetings on physical therapist assistant curriculum design and programmatic assessment. She is the 2009 recipient of the F.A. Davis Award for Outstanding Physical Therapist Assistant Educator. Rebecca has been providing educational consultation in the areas of curriculum design, development, and assessment for physical therapist assistant programs nationwide since 2007.